Distributed storage and distributed processing of large data sets have always been a challenge for IT admins. This increasing need to store and process large data sets efficiently led to the development of the Hadoop framework. With its massive storage capacity and enormous processing power, Hadoop allows users to manage ever increasing data sets and perform tasks easily. However, it is important to ensure the smooth functioning of the Hadoop framework. 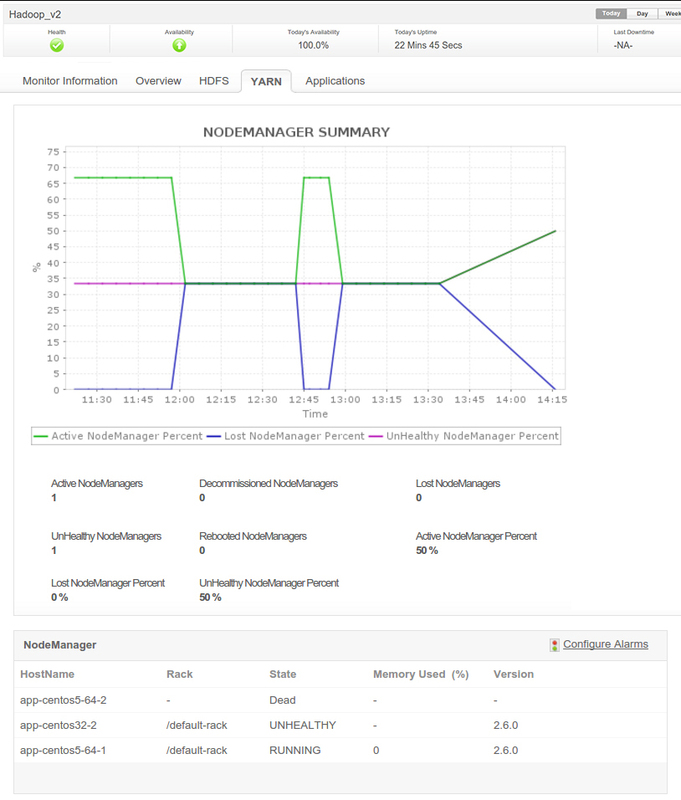 With Applications Manager, it's easy to get operational insight about your Hadoop environment, connect to Hadoop clusters via REST API or JMX, maintain optimal health of distributed Hadoop clusters, and ensure that your clusters are available and processing tasks quickly and accurately. 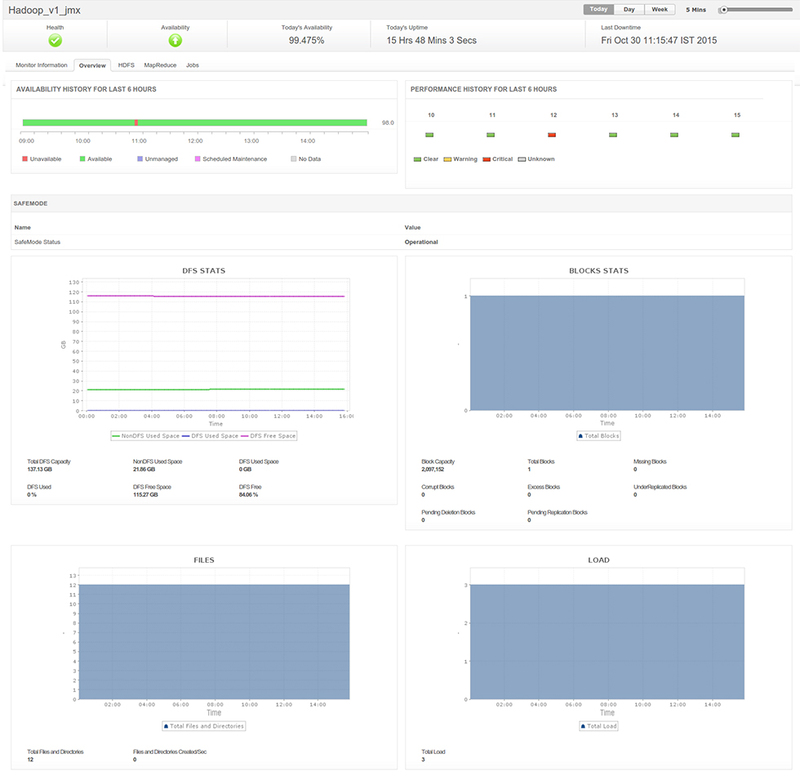 Track the overall health of Hadoop clusters. 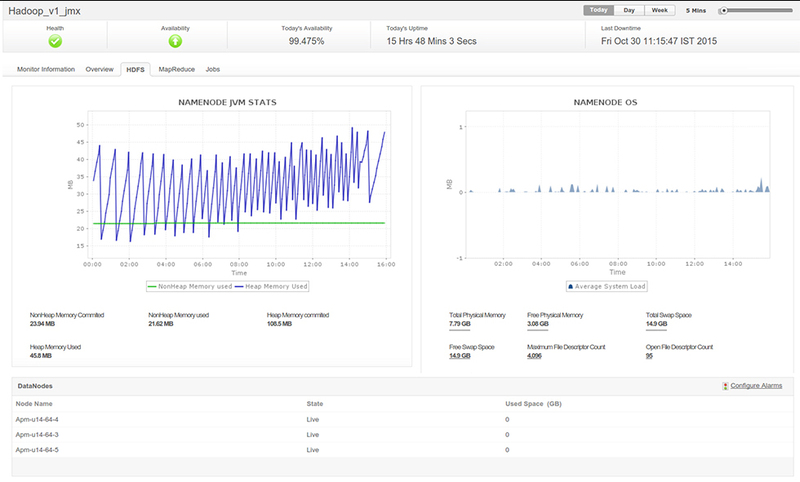 Monitor the availability and health of your Hadoop system. Track file and directory growth and prevent any possible problems due to abnormal growth in the number of files. Track the status of blocks (missing, corrupt etc.) to ensure data is being stored optimally across the Hadoop DFS. Monitor the Hadoop Distributed File System (HDFS). 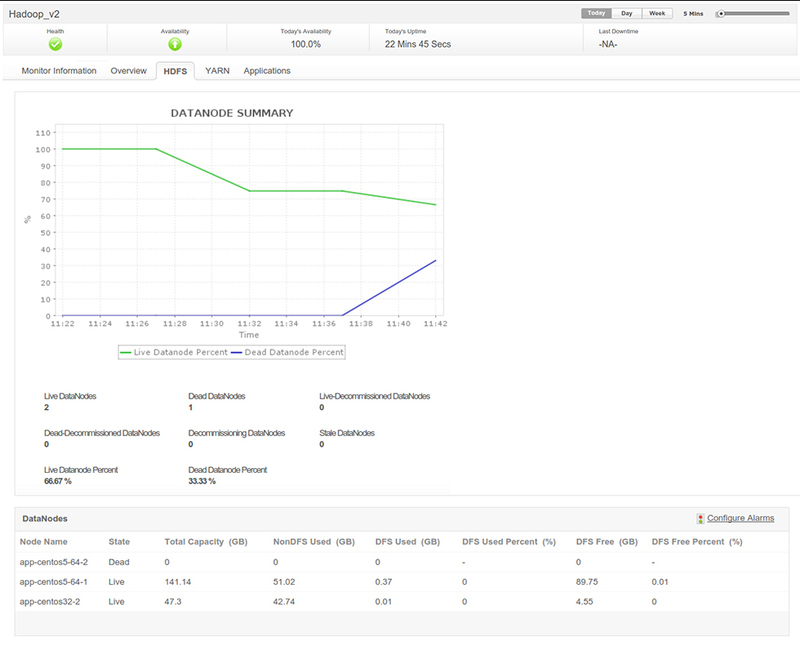 Understand the capacity and usage trends of HDFS by tracking the status of NameNode JVM and OS. Receive notifications when the thresholds are breached. Monitor the status of individual DataNodes and get instant notifications when they go down. Track the HDFS memory, and be notified in case of memory shortage. Understand the performance of TaskTrackers or NodeManagers. Track the status (alive, dead, graylisted, etc.) 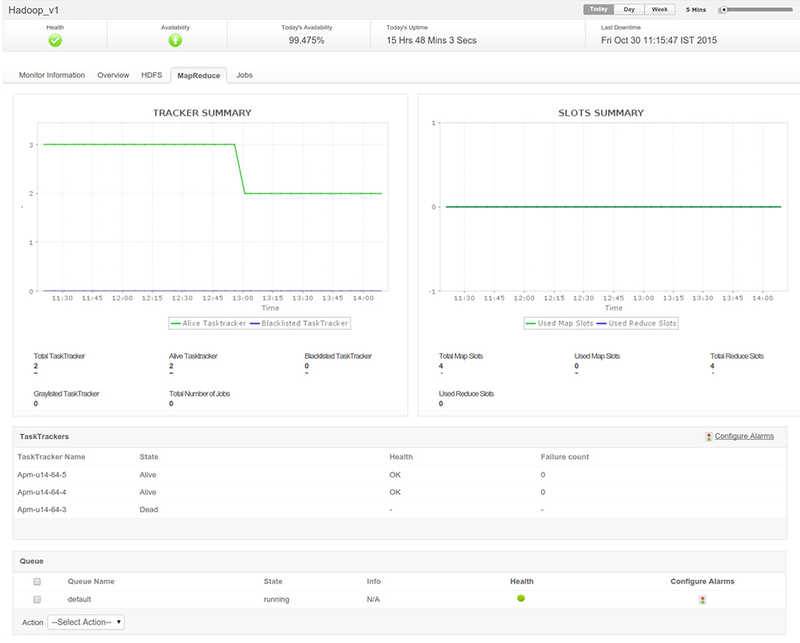 of TaskTrackers and slots in Hadoop version 1.x from the Hadoop MapReduce. 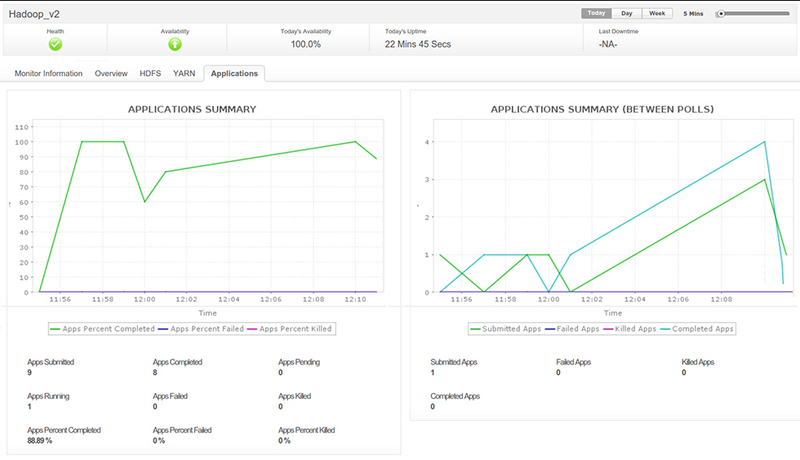 View the queue status to determine whether tasks are running perfectly or the queue is stuck. 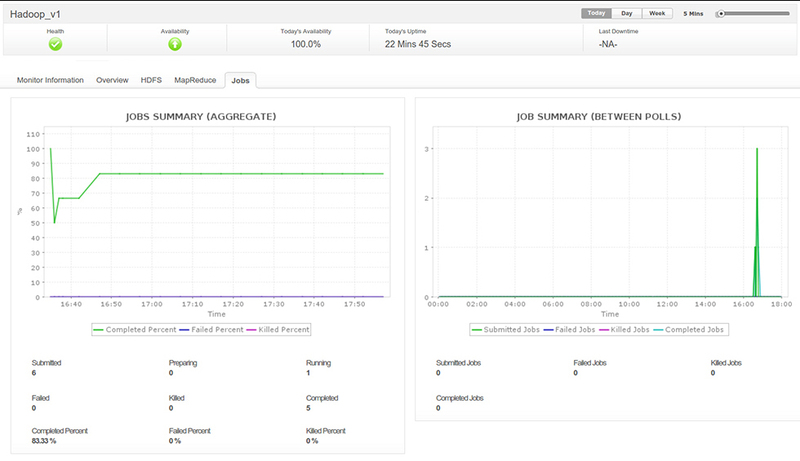 For version 2.x, track the performance of the NodeManager from the Hadoop Yarn. Learn the node counts in different states such as active, decommissioned, unhealthy, and lost. Track the status of jobs or applications easily. Always be aware of how many jobs or applications are running at a given time. Sort all jobs or applications by their states. Receive notifications on the number of jobs or applications that have failed, so you can take any necessary corrective actions. Keep powerful information at your fingertips. 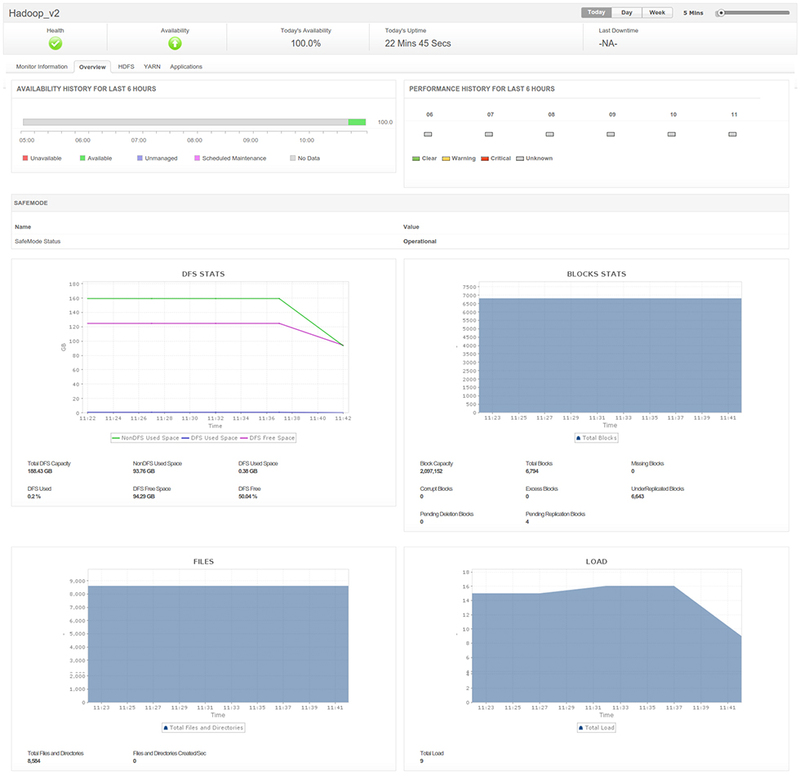 Visualize your Hadoop cluster's resource usage and performance with prebuilt reports and dashboards that show real-time and historical data.